If you're looking for exciting and expertly crafted adventures to add to your gaming rotation, Pathfinder Modules have you covered! Each 64-page Pathfinder Module presents a short, but challenging adventure designed for 2-4 session games within the world of the Pathfinder Campaign Setting. Pathfinder Modules can be run as one-shot adventures or woven into any on-going Pathfinder campaign. Paizo releases an average of three new Pathfinder Modules annually. With your ongoing Pathfinder Modules subscription, we'll send you each new installment and charge your payment method automatically as we ship each product. You only need to sign up once, and never need to worry about renewal notice or missed products. Pathfinder Modules use the Open Game License and are compatible with both the Pathfinder Roleplaying Game and the world's oldest fantasy RPG. By starting a Pathfinder Modules subscription, each release will be automatically bundled with any other Paizo subscription items you're subscribed to releasing in the same month. You may change your starting module during checkout. Not only are Paizo Patherfinder (Gamemastery) modules some of the best in the business they offer more information on the world of Golarion. You receive the books and a free copy of the pdf. Plenty of shipping options as well. A must for any worthy DM. The players are quickly trapped in a pyramid with a team of rival adventurers, and every step they take exposes them to a deadly curse. Fun, varied encounters that will challenge your players' wits. Overall, this adventure does a great, great job of turning the screws on the players -- I'm not sure if I'd rather run it or play it. Easily adaptable to other milieus. How does the shipping work with Gamemastery Subscription? Is it discounted? Ditto the above question. Plus I have one of my own - not to sound cheap or anything, but is there a reason the subscription has no discount whatsoever under the cover price? Sure it saves me the hassle of making my FLGS order the products and then purchasing them locally but every subscription (to any product, even non-gaming) I've ever heard of always rewards the subscriber. Don't you want to encourage people to subscribe? I'm puzzled. It appears (I am not an official source) that the subscription gives you the PDF version for free, and soon you will be able to discount shipping if you combine it with a Pathfinder subscription. Everything Ben said is correct. Retailers get upset when publishers discount their own products. We can get away with discounting Pathfinder because we've positioned it as a replacement for Dragon and Dungeon, but we can't do that for everything. So, the big subscriber perk you get is the free PDF, and the ability to combine it with a Pathfinder subscription to save on shipping. I can't just pay, like, $90 once a year and have them shipped to me monthly? Are the modules expected monthly, bimonthly, whenever...? How much does each one cost; are they different prices? I really don't want to wade through 100s of threads and thread responses to try and get these answers; please let me know. The modules will be released monthly. If you sign up for a subscription, the card you use will be chaged once per month, just as the module ships. For the foreseeable future, all GameMastery Modules are $12.99, and they will come out once a month (excepting unexpected delays in international shipping, etc.). If we decide to up that frequency or change the price, we will give plenty of notice and will spread the news far and wide. D0 is not part of the subscription deal. Subscriptions start with D1. If you want to get D0 you have to order it separately. When do we get to combine it with a Pathfinder subscription? If now, how? You can't... yet. But we plan to make that option available before the first Pathfinder ships. Thanks for the response, Vic! Keep up the great work! 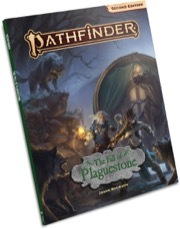 I'll admit it - I'm a gaming whore - I've converted my Dragon/Dungeon subscriptions to Pathfinder (I'll get 5 issues of Pathfinder), pre-ordered D0 and D1 and then when the subscription to the Game Mastery line was announced I trounced on that. Am I supposed to get D0 as a download? Am I going to get another D0 and another D1 when it gets released because I signed up for a subscription? As far I understand it, D0 is not part of the subscription service so you'll only get one of those from your preorder. You can also download the free PDF version now that its out. As to D1 yes you'll get two unless you ask Cosmo or Corey to delete your preorder. Rhothaerill is correct. I cancelled your preorder, so you'll only get one copy of D1. I think this is a really unique way at looking at module acquisition. Granted, at the moment, it's a bit steep (tacking an extra $3-$4 on for shipping) but that's only a minor setback until everything is rolled together. The best benefit that I see is that I won't have to fight all the other geeks as my local hobby store to get my hands on the latest batch of goodness. Plus, the added .pdf download makes it even better for those of us (like myself) that like to have both electronic and physical copies of things. My DM screen is my laptop. 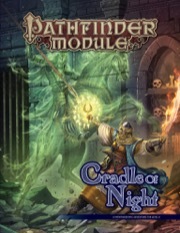 Any undate on the combined shipping cost for Pathfinder and Gamemastery modules option? As a UK customer The added shipping cost is the only reason I havent subscribed to the Gamemastery modules line. With D1 now out (and D0 available to me as a download only) the decision to buy the PDF version when its released is the only way I'm going to obtain it unless I can have it shipped with Pathfinder. Personally I prefer the PDF version over a hardcopy simply because it makes life as a DM so much easier; to cut and paste the information into the format best suited for my DMing style. By the way, when can we combine the shipping on both the Gamemastery Modules and Pathfinder? Right now the separate shipping price is not that much, but it will eventually add up. We'll make an announcement, definitely, when it's available. And probably send an email, too. It'll be an option on your My Subscriptions page. If I subscribe today, will I still get the first module? Or am I too late for that? They already shipped D1: I'm holding mine in my hands right now. On the other hand, the subscription is cover price, so it should cost you the same amount to just buy it now that you've missed it. In the near future, people will be able to choose to start their subs with either the previous module or the next module. Until that code is done, everybody's starting with the previous module, which is to say D1. Step one is letting you combine Pathfinder and Modules subscriptions. You still can't do that, but you'll be able to before the first Pathfinder ships. Step two is letting you combine other things (like D0) with subscriptions. That's further down the road. Vic, any idea when step 2 will be complete? The only reason I ask is that I need to buy #139 of Dungeon (the first part of the STAP) as I am missing that issue but I don't want to pay a almost the cover price in shipping for it. If I could add it to my Pathfinder mail-out it would only cost me a dollar or two extra in shipping. The thing that worries me is that the copies may sell out before I have a chance to buy my copy. Are there plenty of copies available still? If not, could I pay for mine now and get it shipped whenever you sought out the whole combining other orders with subs issue? Thanks for the info. So, D0 has to wait until Step two is completed. Is this still the case? I just ordered today, was curious if I would be getting W1 first or D1. Thanks, much. Honestly, I have no idea when we might have that ready. I think it's extremely unlikely that it will be ready before at least a couple of Pathfinders have shipped. We have around a hundred copies left, and we've sold about twenty in the last month. So at the current rate, we've got a five-month supply... but obviously we can't guarantee that that rate won't change. As for paying now and shipping when we can combine it, you're really pretty much asking for the code that *is* step 2 above, so no, we can't easily do that. I'm a subscriber to both Pathfinder and GameMastery Modules, and even after reading this discussion thread, I'm not entirely sure of how shipping works. When the combined shipping offer comes, will I be able to take advantage of it, or am I stuck paying the separate shipping costs for both, since I pre-ordered Pathfinder? If the former, would it be done automatically? Apologies in advance if I'm repeating a question already asked and answered. Thanks! I don't have a date for you yet, but our goal has always been (and continues to be) to have combined shipping ready by the time Pathfinder 1 and GameMastery Module D2 ship, in the middle of August. W1 is slated to ship next week, well before Pathfinder 1; combining those two is not (and never has been) on the table. GameMastery Modules are scheduled one per month. Your credit card is billed when the new module ships. ....and I have to say that I'm already eagerly anticipating their monthly arrivals....not yet as much as Dungeon's arrival, but it's getting close. I'm running D1 right now and my players are having a blast and so am I. The maps are beautiful and the glossy paper and quality are better than any other module I've ever bought. Call me a fanboy or boi or whatever, but I don't care. If you guys promise not to tell Erik that I'm running them in Eberron, I won't either, okay? If we already have a Pathfinder sub and I now order a Gamemastery sub, will Paizo automatically combine shipping? I've bought the first two GameMastery modules and liked them. Now I'm interested in subscribing, but this combined shipping delay is keeping me from doing so. Also, there doesn't seem to be a way to request the subscription start with a certain module. I'd hate to subscribe now and end up paying for another copy of Bloodsworn Vale, for example. I dont have any of the Gamemastery modules yet. I am ordering the subsription today. I read that they will start with the latest available module, in this case D1. I will buy D0 too. You might actually be getting W1, I received an email notice that it was about to be mailed to me. You might want to post a question about which you'll get over on the customer service threads. Good point! I will do that. We're working on all of this. However, our code is already clever enough to know that if you purchased W1 from us, then your subscription should start with D2. So far the only thing Gamemastery has shown me that I was impressed enough to aactually purchase has been the cards of magic and mundane items. The modules don't look quite as interesting. Glad you liked the cards! Happily, we have lots of different products for lots of different gamers! Quick question...I'm a little late in setting up my GameMastery Subscription and missed out on D1. I've got D2 and W1 sitting in my Sidecart to ship with Pathfinder #2. If I were to add D1 to my cart, assuming it goes into my Sidecart to ship with PF#2, would I also get the free pdf access or, since I hadn't subscribed early enough, do I need to purchase the pdf separately? Thanks! ...since I hadn't subscribed early enough, do I need to purchase the pdf separately? So I picked up all the current modules at Gencon. Due to my extensive gaming network I never know what I'll run/play in. So I can't read any of them all the way through until I'm ready to run them. BUT I love what I have read/seen. So the question becomes the module pictured now is seven swords of sin, if I subscribe now will I get that module, or the next? If its still swords how long do I have to wait to get on-board for the next module? Thanks! One more question: Since the date for both products is simply listed by month rather than actual date, its hard to tell which one is generally shipped first. So the question is: which is more advantageous, to have Pathfinder subscription hold for GameMastery, or vice versa? If Pathfinder is usually released the week before GameMastery, for instance, it'd be better to have it held, but if it's released the week *after* GameMastery it'd be better to hold the GameMastery subscription. Anyone know which usually comes first?